Amish businesses range from mom-and-pop roadside stands to large builders and manufacturers selling product coast-to-coast and even internationally. Amish thrive in a number of key business sectors catering to both English (non-Amish) and Amish customers. Furniture makers-Furniture is a key industry for the Amish. One study shows that Amish may account for 10% of domestic furniture shipments in the US. Amish furniture manufacturers produce everything from rustic-style hickory rockers to upscale luxury lines. Amish also create custom furniture pieces. Some specialize in cabinet making and custom kitchen work. Amish furniture makers are typically supplied by other Amish businesses, from sawmills which process wood, to businesses which specialize in producing furniture parts. Outdoor products are a key part of this segment, including Amish gazebos and Amish-made sheds. 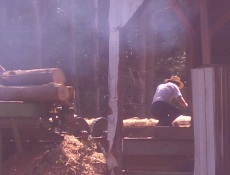 Builders-construction is another industry where Amish are highly active. Amish may take on the role of general contracting or subcontracted work. Amish do new residential and commercial construction, and also do remodel work. Amish builders may travel up to two hours, or in some cases even further (sometimes staying overnight) for work. Amish may specialize in framing or foundation work; Amish roofers do roof repair and replacement, often for residential structures. Some Amish build custom structures and barns. Sheds are also a common product produced by Amish. Produce farming-produce is an increasingly popular form of business for Amish. Produce farming allows Amish to operate on smaller plots of land, a must in some communities with high real estate prices and a scarcity of acreage. Outlets such as local produce auctions, co-ops, and Community Supported Agriculture (CSA) programs have provided markets for Amish produce farmers. Market stands–market stands are popular among Amish in Lancaster County in particular. The proximity of this community to highly populated urban areas has encouraged Amish to set up stands in Pennsylvania Dutch-themed markets. 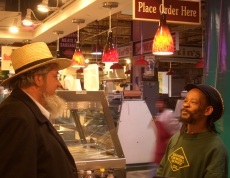 Amish markets can be found in places such as Philadelphia, Baltimore, and Washington, DC. Amish vendors sell everything from food to crafts to furniture. Amish workers will typically be driven by hired vehicle to the market, which may be two hours distant. Typically Amish operate their market stands three to four days a week, though some may be open longer. Monday is often a day off, as is, of course, Sunday. Auctioneers-auctioneering is a trade plied by some Amish, who typically work local Amish auctions (as well as others). Quiltmakers-quiltmaking is an especially popular industry among Amish in highly-trafficked tourist centers such as Lancaster County, though even Amish in more remote settlements such as those in upstate New York may be active in the quilt making industry. A painstakingly-made quilt can take a couple of months to produce, and may fetch $1000 or more in tourist shops or at auction. Accountants-accounting and bookkeeping are two less-common trades among Amish, but many Amish communities of a certain size will typically have at least one or two Amish accounting businesses. Amish accountants handle payroll and other accounting issues, and may offer business advice to Amish entrepreneurs. Buggy makers and harness shops-The demand for buggies and related products is always present in Amish communities. 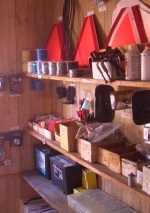 Even smaller communities typically have carriage shops and harness suppliers. Amish buggy and harness shops may service the non-Amish public as well, providing products that otherwise would not be allowed by the Amish Ordnung. Some Amish buggy shops will even do classic car restoration (typically turn-of-the-century vehicles), as is the case with at least two shops in Lancaster County. Amish businesses range from family-run stands and shops to sizeable manufacturing and building firms employing 20-30 or more. Amish typically restrict business size out of an appreciation for the small-scale, and reflecting the Amish value of humility. Some Amish may be compelled to sell off part or all of their companies if they grow “too large”. According to some Amish, the idea of “too large” may be more a factor of an owner’s individual attitude rather than a numerical limitation. In rare cases, Amish “mega-businesses” may have 100 or more employees, but these are very uncommon. Estimates have shown that Amish run 9-10,000 businesses in North America. Some church districts may be highly entrepreneurial, with even half of households running some type of company. Others may be much less so, with only 2 or 3 exhibiting business activity. An individual church district’s stance on technology may affect degree of business activity, and what types of businesses are permitted to develop. Generally, Amish tend to make greater allowances for technology in a business than on the farm or in the home. Amish define success in different ways. Some are content with a business that allows the owner to work at home with family and to put food on the table. Others are motivated by growth and set financial goals. Amish appreciate ideas such as giving back to the community by providing employment, financial contributions to causes such as auctions, or by mentoring employees. Others are motivated by the idea of creating something of value for the next generation to take over. As a whole, Amish have registered 5-year business survival rates of over 90%. In some cases, Amish have achieved unprecedented financial success, which has led to some concern over how an influx of wealth will affect Amish society over the long-term. 7 responses to What are typical Amish businesses? How to find an Amish contractor in Indiana? Kirby, since you’re close I would visit the settlement and ask in an Amish business (shop or store) if they’d have anyone they could recommend. I wouldn’t be surprised if Parke County had Amish that do that work. A web hunt may lead you to an Amish contractor who is advertising online but often it is unclear whether the business is Amish unless they state it outright (Amish are not always comfortable doing so). Also perhaps in your neighborhood, the community at Milroy (Rush County) should have a number of builders as well. It’s possible you may see signs for Amish construction companies visible in either of these communities as well. Amish companies often have generic sounding names “A & J Builders”, “Meadow View Construction”, possibly with an Amish name in the title (In Parke Co, that would be Stoltfus, Zook, King, Lapp and other PA-origin names, Rush County more of the Yoders, Millers and Hershbergers) and rarely have “Amish” in the title. Thanks for the advice. I will be heading down that direction in short time hopefully. A lot of our women who’s husbands allow, it make money through selling extra starter plants, making and selling Quilts, Clothing, selling produce, making baked goods, and some even clean houses. I myself own a Quilting business, though i sell every thing i just mentioned and some of the crafts that our men make. It’s actually quite helpful and it always give me some extra money to help out with some of the bills. We find running our own business help with staying close to our faith. We even have our own bartering systems inside the communities. We believe in helping our neighbors as well, so if there is a barn or house that needs to be built, some of the time you will find unnumbered amount of Mennonite families at a Englishman’s Ranch to help build. Hi – I am looking for a contract manufacturer for bedding – comforters, quilts, sheets and blankets. Please let me know if you can help. Leave a reply to What are typical Amish businesses?